With the financial crisis upending the political scene, I turned for advice once again to the master of crisis management, Julius Caesar. As usual, his ghost was ready to talk. I notice, dictator, that President Obama has not taken the blame for Standard & Poor’s downgrade of the U. S. credit rating. In fact, his advisor, David Axelrod, went on television to blame it on the Tea Party. Likewise, Governor Romney recently declined to say that he had done anything wrong in bringing Romneycare to Massachusetts – a health plan similar to Obamacare, which most Republicans oppose. Wouldn’t it have been politically shrewder for these men to cop a plea and move on? Have you left anything undone when it comes to demonstrating ignorance? Never confess; never obsess. That is the rule for leaders. Be as blameless as you are decisive. The public wants no less. We don’t want to absolve our leaders, we want to believe in them. 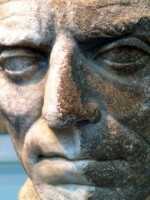 Caesar’s army suffered many evils at the siege of Dyrrachium in 48 B.C. Indeed, the enemy might have defeated us there – if Pompey knew how to win. He was too timid to press an advantage. Afterwards, I called my men together and told them to take heart. Instead of being depressed by one defeat, they had to trust, instead, in the achievement of all our prior deeds. Above all, they mustn’t blame Caesar. Who was responsible for the loss? “Anyone other than Caesar,” I said. Caesar had brought them to the edge of victory, but the men failed to follow through. And so they sustained a loss, but they could repair things now by exerting themselves in deeds of bravery. Yes, but only because, having been driven from my prior plans, I judged it necessary to change my entire strategy. I left Dyrrachium and lured the enemy into fighting on terrain that favored my men. Then I won a great victory. How might Obama turn his setback into a victory? By making himself indispensable to the new congressional committee that will cut the federal budget. By brokering a grand deal to turn American finances around. By being a strong and decisive leader who resolves a crisis. He failed to dominate the debt crisis before but now he must change course. Wasn’t it a mistake not to fire Secretary of the Treasury Geithner? Far from it: if heads must roll, let them be of lower rank. After losing a battle I disciplined non-commissioned officers but not the senior staff. Firing a high-level official is like admitting that you made a mistake in hiring him in the first place. Couldn’t the president change the subject? Wouldn’t that help? There is no bigger subject in America than the economy. Still, a distraction might help. Caesar pursued one after Dyrrachium. Although he usually protected civilians in order to win their benevolence, after Dyrrachium he let the men sack a small city, in order that they enjoy the loot and mayhem. They felt better afterwards. You are not seriously suggesting that our government do likewise, are you? If I were president, I would throw open the Arctic National Wildlife Reserve to drilling. Just this once, I would drop my environmentalist objections. While boosting the economy it would distract the media and confound his opponents. Let Standard & Poors downgrade them.